The pioneers of postal transports by railway were the red luggage wagons which in the beginning served without any interior fittings or adjustments to their duty. In the wagons there were no shelves, no sorting tables and also no heating device, not even the simplest stove. 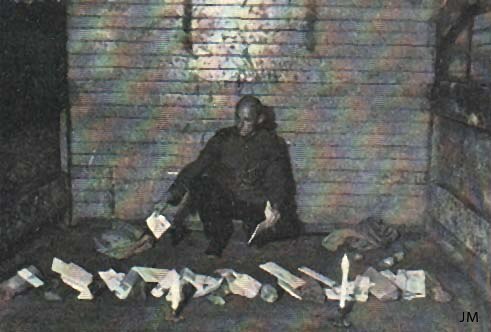 The sorting took place on the floor - the sorting clerk kneeling down. To fairly well protect the items of mail from mixing up during travelling the sorted heaps were divided by logs of wood. At nightfall the sorting went on by the weak light of candles, the only convenience in the vans. The acquisition of the first real Travelling Post Office happened in the beginning of 1920. By the withdrawal of the Soviet forces, among other railway wagons that had been left in Daugavpils, also a special, for postal mail delivery build wagon, was found. This one at first had came into the hands of the Polish forces but thanks to a Latvian colonel, former Post Office employee, a barter transaction came about where the Poles became an other wagon but the Latvians this mail van. However, to get this needed wagon the exchange officiator also had to provide the Poles with some bottles of brandy. 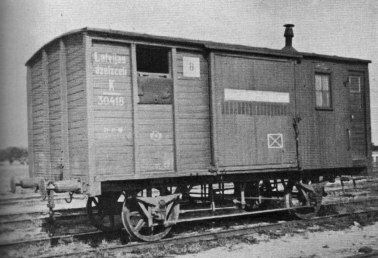 Among the in February 1920 (according to the treaty of Versailles) received railway carriages there also were two Travelling Post Offices and two wagons partly fitted up for postal services. Two of these - one of each kind - had served their duty and were of no use. Because being without Travelling Post Offices they were repaired (in the Railway Workshop in Liepaja) and reintroduced. One of these repaired TPO's was in 1938 taken out of duty. The other one was, by that time, still in use, however, it now had come into a miserable condition. According to the treaty with the Soviets the intention was that 18 Travelling Post Offices would be transferred to the Latvians but they got only 3. Two of these were Finnish wagons. All three were in bad condition and needed put into repair. This was at a quick pace made by the Railway Repair Workshops. By this time postal mail services were resumed on all railway lines as Riga - Saule (later to Valka), Riga - Rezekne, Riga - Stukmani (now Plavinas) - Gulbene, Riga - Ieriki - Gulbene, Gulbene - Pitalova (now Abrene) - Daugavpils, Riga - Ventspils, Riga - Liepaja (via Mazeikiai in Lithuania), Liepaja - Aizpute - Saldus and Ventspils - Dundaga - Stende. There was a great demand for facilities for conveyance by post. To fairly please this demand six luggage wagons were equipped for postal needs in the years 1920 to 1923. They had built-in windows, sorting tables, shelves and also a stove for the heating. These wagons faithfully served the Post Office for a long time until the end of the thirties. When new, more convenient, Travelling Post Offices were built the old one's again were returned to their ordinary duties. Already in 1923, because of the growing conveyance of as well domestic as transit mail (from Western Europe to Russia, China, Japan and Persia via Latvia), the want of TPO's was affected. In that connection the Workshop "Feniks" in Riga had to build new with 4 axles TPO's which were fitted for their purpose with a secretariat in the middle and store-rooms in each end of the wagons. For faster delivery of normal letters from Riga to Tallinn, and return, the wagons of the express were, from March 21st 1924, equipped with letterboxes to be collected at the terminal stations. This well advised introduction came to an end already on June 5th 1924 because of the wagons often didn't work and had to be withdrawn during the journey. In 1927, when transit mail from Western Europe more turned to Poland and the domestic railway speed not was so high, for mail delivery purposes, 3 axle wagons were built in less considerable proportions. Until 1930 there were 4 of these built. In 1938 two more wagons were altered to TPO's and in 1934 and 1935 another four, of which two (because of the gauge) were meant serving the Rezekne - Sita line. With times of prosperity and mail services on recently built railway lines there was (in 1938) a demand for building wagons with 4 axles. This was done in the Naval Shipyard of Liepaja. These wagons were of modern design with 1 meter wide windows and rounded streamlined tops. The coach work was designed with very solid gables, already tested and showing their solidity in passenger coaches by some accident occasions. The wagons had a steady gait and were well fitted for postal services. In 1938 there were 38 TPO's in duty. Even though they not were alike, some were of elder design, some were only with 2 or 3 axles not fitting for fast railway speed, the numerous of those wagons corresponded to all demands drawn up for forwarding and preparation of mail during the train journey. In 1938 almost all TPO's had electric lighting and other possible conveniences. However, some of the wagons still were without electric lighting. When the engine left at the last stop of the railway line in these wagons, when darkness was falling, the work had to go on by the light of candles. The mail trains were not only established where few post offices existed or where the trains passed at times not fitting ordinary postal services. With some few exceptions, all railway lines were used for mail services in the end of the thirties. The Travelling Post Offices were according to the circumstances complete post offices which just in time moved between the terminuses of the railway line. The TPO's had their own postmarks, sealing nippers and other necessary effects. Besides mail reception from ordinary post offices - preparing and delivering of mail - also as well common as registered mail from the railway stations, from mail coach drivers and from collected letterboxes of the TPO's were handled. When time did admit it also was possible to buy postage stamps in the TPO's. Besides postal services also security transports for the Railway Administration were handled by the TPO's.